Fugate Woods Nature Preserve – two and a half miles northeast of Fairbury is 150 acres of naturally preserved woodland that is open to the public from dawn to dusk every day except Mother’s Day and firearm deer season. This expose of timber, prairie land, native plants, and wildlife is accessible through its main entrance located off of country road 1000N or following the A.I. James Memorial Path east of the High School and it is crisscrossed by six different walking trails that will take you on a jaunt through the area’s best of Mother Nature’s treasures in all their natural beauty. As you walk into this protected park, and the vestiges of civilization fall from sight, you can see how the land was hundreds of years ago and the only sounds were those made by natural sources – animals, birds, moving water and just maybe a young Indian boy catching a fish. Once you’re in the confines of these serene surroundings you can just about envision how it must have been at one time a long time ago. Of course, if you have a good imagination you might be able to conjure up some wood elves and pixies in amongst the trees, dead falls, flowers, plants, shrubs, and bushes that go edge to edge in this outdoors wonderland. You can get your exercise to whatever extent you want, put your mind at ease, incite your optical senses to the max, and just simply enjoy the inspiration that can only be gained by being there. Walk for a ways, sit for awhile, look, listen and come to know that there is more to this experience than one might think before trying it – bring a lunch (clean up after yourself though) and relax because there really isn’t much of a better way to escape the rigors of everyday life than the peace and quiet you can find in this well kept park’s natural preserved environment. Trust us when we say that there are things here that are not in your backyard and, if you don’t already know, this area has an incredible amount of outdoor life that is indigenous to its location and it’s all right there waiting for you to come and see for yourself so, do it – take the family, go with friends or just by yourself but, go and see what a group of hard working folks have kept intact for your enjoyment. 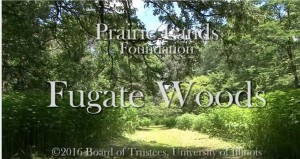 For those of you that might have a group interest, there are opportunities, through a variety of programs and events, that you can take advantage of in this living classroom environment and, for more information you can go online to www.fugatewoods.org or contact the very knowledgeable Steward of the Woods, and your expedition can be made into a reality. We also need to note that, for the preservation of the habitat and well-being of all visitors, there is no alcohol, no firearms, no hunting and no vehicles allowed on the grounds. Come on out and realize that there is more to life than computers, TVs and electronic games – this is a world unto itself that is worth exploring so get off your seats and on your feets and make it happen! We’ll see you there, where Indian Creek meanders up close to “Sky Spirit Trail”.